also get some errors saying "too many files open" but I dont know what files these could be, I do not have any more programs running than usual and don't have much open myself. Most of these anonymous processes are labelled things like (pmset) and (networksetup); no clue what that means, Google did not reveal anything useful. Also while trying to run ps -aef | grep '(' | wc -l the entire terminal window crashed; when I brought up a new one and ran it again it returned 753, meaning there were about 753 of these anonymous processes running. Rebooting solves the problem but only temporarily, eventually it creeps back up. Randomly it goes away on its own. Right now the number of total processes (ps -aef | wc -l) is back down to 350. Total memory and CPU usage during all this is very low, so they do not seem to be culprits. Any idea what is going on? How am I accumulating all these processes in the first place? For reference, I am running macOS 10.12.6 High Sierra on an iMac. Another clue, I managed to catch this happening before my terminal completely locked up, and I can actually see from the ps output (ps -aef | less) that these processes seem to start spawning about ~30min after I arrived at work this morning, immediately following the start of a process called PwrMgrDaemon. It then proceeded to spawn 2 new threads per minute for the entire day. I caught it around 3:50pm when I started getting errors and again there were a total of 1056 processes running, including a massive amount of these pmset processes. Strangely, while I was taking screenshots and typing up this update, all of these processes vanished and things went back to normal. 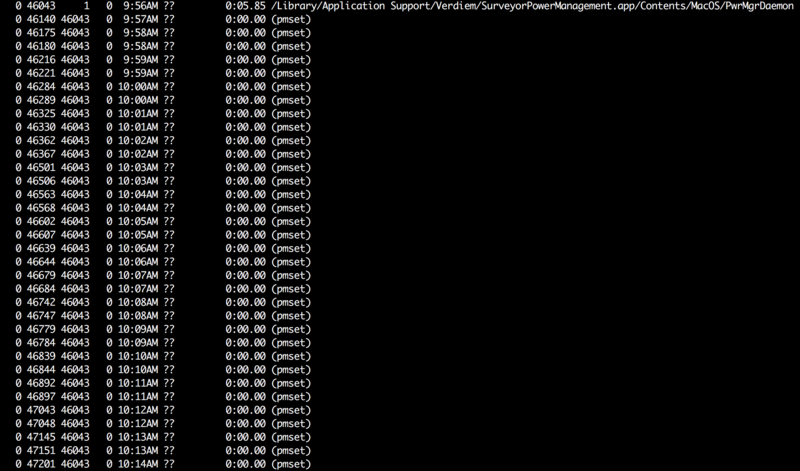 You have the program Surveyor Power Management from Aptean installed. This is usually installed as part of a corporate setup, and is used to manage power saving settings across all the company's computers. Unfortunately it seems that the program has a bug where it is not compatible with High Sierra right now. The effect you see is that it spawns processes intended to set power saving settings, but due to a bug it spawns them over and over again because it "thinks" that they failed. This severely limits performance of the computer and eventually halts it completely. The only thing to do is to report this to your IT department and/or directly to Aptean to ensure that the software is fixed and updated. Not the answer you're looking for? Browse other questions tagged macos terminal crash . Why are assigned PID numbers not sequential from 100?